Our thoughts are with Mitch Blackwell as he recovers from shoulder surgery. Get will soon Mitch, we need you back out drilling it making us all faster ! I found an excellent place to get gym/fitness/performance equipment. It's up on 380 (South side) a half mile west of Custer. The guy who runs it, Paul Johnson, is one of the best guys I've met in a long time. This is serious stuff for a very good price. I spent a long time looking for various implements for home use and this is the only guy who had them. How many places in the metroplex can you buy from 3 to 200 lb kettlebells?? If you've got kids in sports, he's got stuff that can benefit them too. It's set back off the road a bit but worth finding. 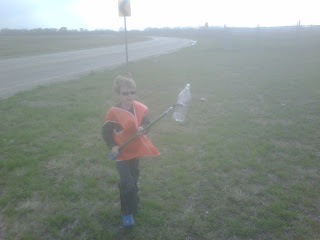 Trash Talking at our 1st Quarter Adopt-A-Highway cleanup . In 2008, McKinney Velo dipped its collective club toe into the race promotion business when we helped Andrew Armstrong and his Jesuit High Cycling club put on the Jesuit Ranger Round Up just outside of Celina Texas in far northern Collin County. The course is a rolling 9 mile rectangle that produced some dynamic racing in '08. This year, McKinney Velo is jumping chest deep into race promotion beginning with the 2009 edition of the Ranger Round Up on Sunday March 8. AA has graciously renamed the event the McKinney Velo/Jesuit Ranger Round Up for 2009. Follow this link and sign up for what looks to be a splendid day of road racing following the Horse County TT and the Denton Rhapsody Crit being run on Saturday. To people of MVC, we have a nice 20+ group of MVC club members who are volunteering to help make it a success. But we are a racing club... and this is our race. Let's make our mark on the results sheet too, so get yourselves registered. To all non-MVC racers, bring it on. We love a challenge and we love competition, so we invite you to pre-register and come join us Sunday morning for a guided tour of the Round Up pain locker. Lago was fun. After 3 laps half the field was dropped. There was a headwind up the climb so it was difficult for anyone to get away. After the third lap all the remaining riders rode well. Richie and I finished with the lead group. We enjoyed the race even though the results were just OK. Neither of us were stressed by the race so it bodes well for the season. Oh we did not get beat by any of the girls eaither :-) There were about 6 Cat12 women riding bandit in our race who all got dropped. Apparently none of them had registered for the race either. It is a shame more of you did not join in the fun..... Marco.